Modern American anthropology owes a lot to one man: Franz Boas, widely regarded as the father of the discipline. Indeed, before Boas, anthropology in the United States could hardly be called a science. It was carried out by those who believed that some cultures were more evolved than others and that they could be set in a line with cannibals at one end and white Christians at the other. Hardly surprising, since much of the information these proto-anthropologists used came from missionaries or government officials. Such secondhand data were of no use to Boas, who in the late 19th century went into the field to live with the Kwakuitl Indians on the U.S. northwest coast and see what was going on for himself. In doing so, he gave to anthropologists the idea of empirical data collection. He rejected the idea that some cultures could be superior to others, introducing the idea of cultural relativism. Cultures evolved on their own over a period of time, Boas said, and it was meaningless to rank them. A Jew who was disgusted by the treatment of blacks in the U.S. and naturally sensitive to anti-Semitism, a huge study by Boas, published in American Anthropology in 1912, laid to rest any argument over there being superior genetic differences among populations. Any variations, Boas said, were environmental. Boas backed up his case using data from head measurements of nearly 13,000 European-born immigrants and American-born children from New York City. He divided the data into population groups: Bohemians, Central Italians, Poles, Hungarians, Scots, Sicilians and Hebrews (individuals of Jewish ancestry). Boas claimed his data showed that far from being a hereditary, genetic phenomenon, it was the American environment that caused differences in cranial form: It was how long you'd had the good fortune to live in the U.S. that made your skull different. Boas' work drew a line in the sand, and anthropology was forever changed. His study is still cited as evidence that the cranium can change shape depending on the environment you grow up in. But that is unlikely to continue because this week in the American journal Proceedings of the National Academy of Science, Corey Sparks, a graduate student in anthropology at Penn State University, and Richard Jantz, anthropology professor at the University of Tennessee, present a re-examination of Boas' data  and their conclusion is rather different. "Re-analysis of Boas' data not only fails to support his contention that cranial plasticity is a primary source of cranial variation, but rather supports what morphologists and morphometricians have known for a long time, that most of the variation is genetic variation," Sparks and Jantz write. Cranial plasticity is Boas' idea that the dimensions of the head  the measurements across the face, the head length and head breadth and the cranial index (a ratio of head length to breadth)  changes readily with environmental factors. "After Boas published his study, everyone said that you cannot use cranial measurements to tell differences in populations. Uncritical acceptance of his findings has resulted in 90 years of misunderstanding about the magnitude of [cranial] plasticity," said Sparks and Jantz. "Boas did some analysis, but he did not do statistical analysis. While Boas did not have the statistical tools we have today, he did know about standard error, means, averages and variances, but he fails to utilize these properly in his study." Sparks and Jantz conclude: "The predominant trend in the data suggests a much more significant effect of age on the cranial index rather than of duration of American residence. This suggests an overall stability of the cranial index in response to changing environment and fails to support the propositions of Boas." The comprehensiveness of the data allowed the researchers to look at multiple generations of families. Instead of Boas' environmental influences, Sparks and Jantz found that most of the variation in cranial shape was due to genetic factors. And, therefore, that cranial measurements can be used to look at populations. "Our data has immediate repercussions for forensic anthropology and such analyses as those of Kennewick Man and other very early human remains," said Sparks and Jantz. In an e-mail interview, Sparks elaborated. "Boas was trying to dispel the notions of scientific racism that revolved around the idea that a large brain size, i.e. a large cranium, corresponded to a higher intelligence. 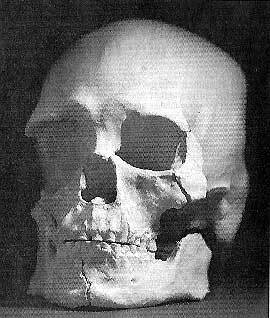 Or more to the point that many 'scientists' believed that Europeans, with their larger skulls, were superior to smaller skulled Africans and Asians." Before his immigrant paper, Boas was one of the most statistically orientated anthropologists. But when he presented his paper, his statistical abilities seemed to have deserted him. What happened? Boas "showed disdain for the often racist ideas in anthropology," the researchers write. Is this why he suddenly forgot to do a proper analysis on his data, so that it would give a result he wanted, and shut the racists up? "We make no claim that Boas made deceptive or ill-contrived conclusions," said Sparks and Jantz. They do claim that the data, subjected to modern analysis, do not support Boas' statements about environmental influence on cranial form. "Even though the term 'race' is quite meaningless from a biological standpoint," said Sparks, "scientists are still quite puzzled by human evolution and the spread of our species out of Africa and beyond. We can infer relationships about the relatedness of human populations, over time and space using cranial data." In other words, Boas' work has hindered scientists wanting to use cranial measurement data in their studies. "The notion of cranial plasticity  or environmental control over cranial development  basically devalues studies trying to use such data to infer human population history," said Sparks. "We decided to reanalyze the data because Boas' study has been sort of a thorn in the side of cranial morphologists for nearly a century." Sparks summed up his reasons for tackling anthropology's father: "Scientists interested in the history of human kind can learn much from using cranial data. We can use such data in a modern context to aid law enforcement agencies to identify individuals, we can also use these data to learn about the history of our species, where we came from, what has happened to us over the past 100,000 years, and how we as humans respond to the world around us." Sentiments that Boas himself would surely have approved of.